A refreshing pasta salad loaded with Italian seasoning, sweet peppers, fresh cherry tomatoes, broccoli florets, olives and cheese cubes! Perfect for any get together or picnic! I know it’s September and that it’s past Labor Day so it’s technically not summer anymore BUT I live in Phoenix Arizona and it’s still 109 degrees Fahrenheit here. It’s HOT! And while all these lovely fall recipes are out and about everywhere, I’m not quite there yet with the warm and cozy cinnamon and spice because like I said…it’s still HOT outside! That’s why I’m posting a refreshing Italian Style Pasta Salad! 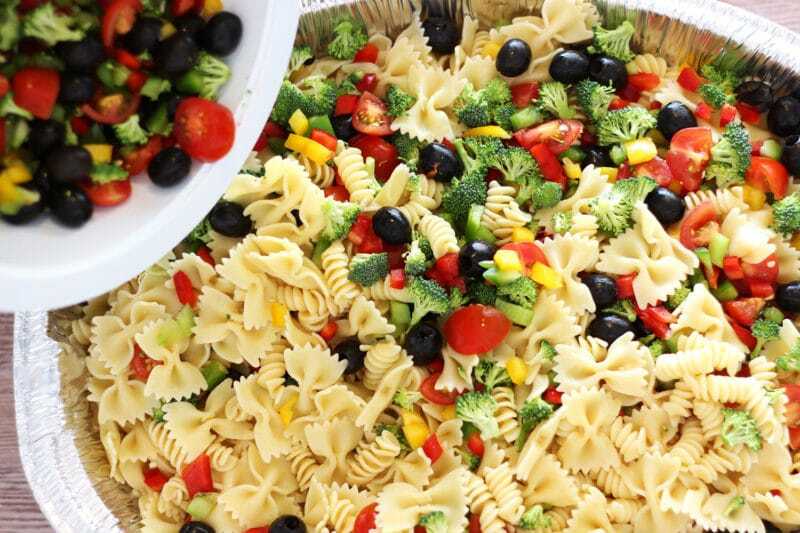 It’s the perfect time for me to post this recipe because I was asked to make a huge pasta salad for my mother-in-law’s 95th birthday party last weekend. We were planning a big potluck at my sister-in-law’s house with tons of delish food…chicken, salad, baked beans, potato salad and my pasta salad. And let me tell you, this pasta salad is delish! 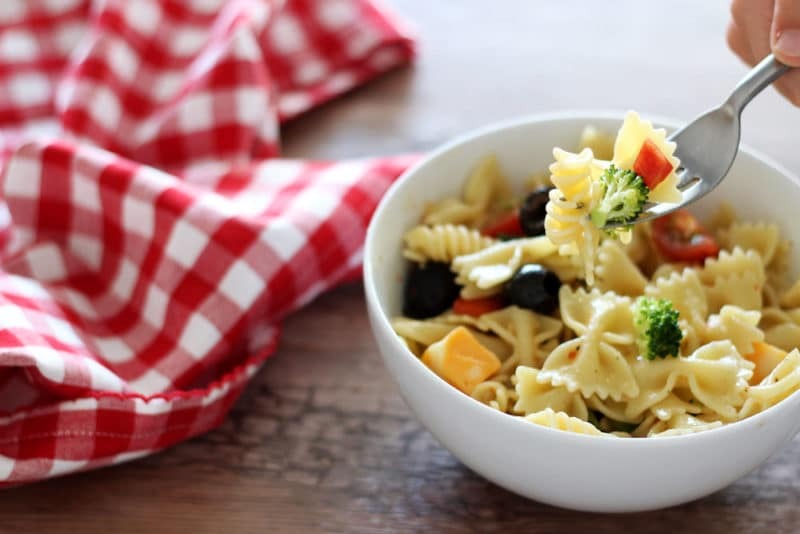 This pasta salad contains Italian dressing, Italian seasoning, red, green and yellow bell peppers, broccoli florets, cherry tomatoes, black olive, cheese cubes and your favorite pasta! Simple, refreshing and delish! And, guess what?!? You can make this pasta salad gluten free! If you’re gluten free, just simply use your favorite gluten free noodle and you’re all set and ready to go! 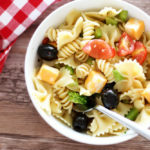 This Italian Style Pasta Salad is so simple to put together. You’re going to start out by cooking your pasta according to the box direction. Then, mix a bottle of Italian dressing with a packet of Italian seasoning, shake well and set aside. Cut and dice your veggies and mix well. When the pasta salad has cooled and you’re ready to eat, add your cheese cubes and toss on the dressing! 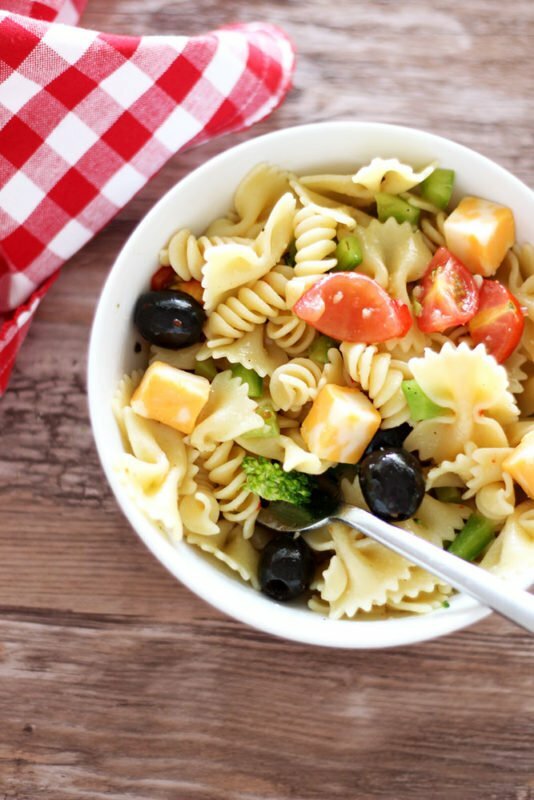 Now you’re ready to fill a bowl with some pasta salad and grab a fork! Guys, this dish is a crowd pleaser and let me tell you…it feeds a big crowd! It’s perfect for potlucks and get togethers. I made a HUGE dish to take to my mother-in-law’s birthday party. We fed about 50 people on this dish below and it was a hit! This dish is also perfect for a quaint little picnic! If you want to make a smaller serving of this pasta salad it’s super easy to pull off. Just half the ingredients listed below. Because our fall season is still quite warm, a lot of people go hiking here in the desert and pack themselves a picnic lunch. This is the PERFECT dish to take to a picnic! So versatile and so delish. This Italian Style Pasta Salad can be made vegan (leave out the cheese), vegetarian and gluten free! How perfect is that! 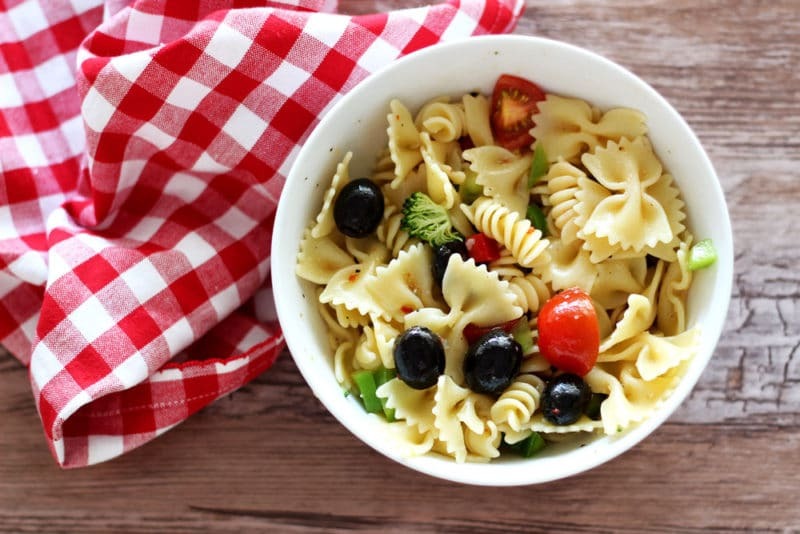 A refreshing pasta salad loaded with Italian seasoning, sweet green and red peppers, fresh cherry tomatoes, broccoli florets and cheese cubes! Perfect for any get together or picnic! In a large pot of boiling water, cook pasta according to package directions. When done, drain the cooked pasta and rinse with cold water. Whisk together the packet of Zesty Italian Salad Dressing & Marinade Mix with the bottle of Italian dressing. Shake well in a container with a lid. Chill for at least an hour. 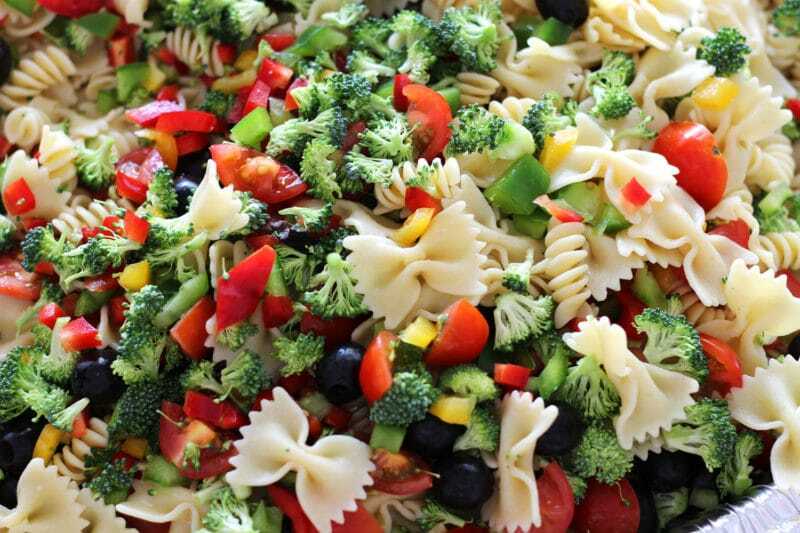 In a salad bowl, combine the pasta, cherry tomatoes, bell peppers, olives, and broccoli. When the pasta noodles are completely cooled, add to the pasta salad. Right before you are ready to serve, pour the Italian dressing mix over the pasta and mix well. Your are then ready to serve! 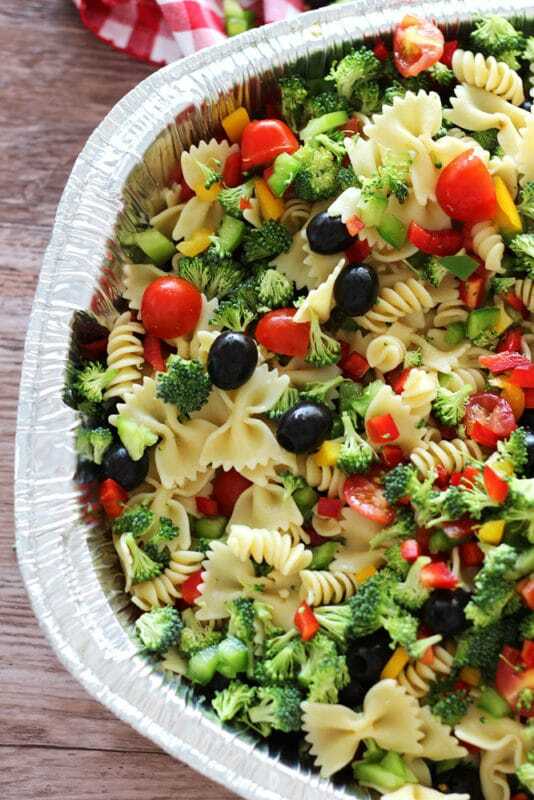 Pin this Italian Style Pasta Salad to your favorite PASTA board on PINTEREST! 109 degrees?! I can’t imagine – I complain when it gets over 80. 🙂 Love a good pasta salad during the summer months, though. This one looks nice and fresh and delicious! Thanks! It is perfect for summer but great all year around! In my opinion, pasta salad is one of the best side dishes of all time. I eat it year round! Will definitely try your version next time I make it — looks great. Than you! I hope you enjoy it! !